Convictions – how will they affect me and my motorbike insurance? Convictions are never good news for you or your wallet. As well as getting you a criminal record, potential fines or a date in court, convictions can also affect your normal everyday life well after the incident. Convictions can inhibit your ability to get a job and they will also impact upon your insurance if they are road related offences. Here, we have broken down how convictions can affect your motorbike insurance premium. A conviction is a type of legal punishment for committing a crime. Motoring crimes carry convictions and you must inform your insurer when applying for insurance if you have been given any within the past five years. You must inform your insurer of any convictions in order to ensure your policy is valid. Your insurance price may be affected by the conviction, depending on its severity. Does speeding count as a conviction? Speeding does have a conviction code and if caught speeding you could be given three points on your licence and a £100 fine. Alternatively, you can choose to take a course on the dangers of speeding. The points will be added to your licence as an ‘endorsement’ and after four years will be removed. What is a ‘spent’ offence? The Rehabilitation of Offenders Act 1974 states that a conviction is ‘spent’ after five years as long as the sentence imposed was less than two and a half years and any rehabilitation period has lapsed. Usually, an insurer will ask you to disclose any offences you have committed within the past five years – those committed previously will not affect your insurance premium and you do not have to declare them to your insurer. Do non-motoring offences need to be noted? Yes they do. There are some offences that carry serious penalties such as jail time or disqualification. You must inform your insurer of offences you were convicted of in the past five years, even if they were not to do with motoring. Do speeding points I am given abroad count in the UK? Currently, there is no standardised system abroad where any points accrued will be transferred onto your UK licence. It is worth bearing in mind however that if you are caught speeding, you could be either sent a fine through the post to your UK address or be asked to pay an on-the- spot fine. Any more serious offences will be subject to a country’s laws. 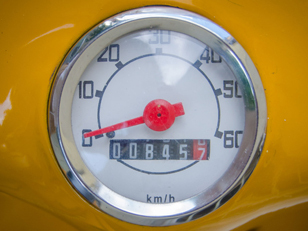 Will my motorbike insurance premium go up? Generally, motoring convictions will increase your motorbike insurance premiums as you are deemed more at risk on the road. Despite non-motoring convictions appearing far removed from the road, you should still expect to pay more than those who do not have a criminal record.